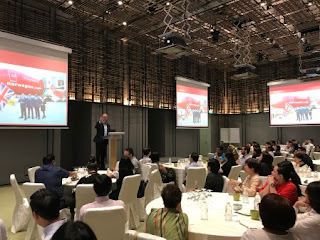 Norwegian has signalled its intent to expand into Asia following the launch of its Singapore-London route at an event hosted by the airline in Singapore this week. Norwegian is the world’s sixth largest low-cost airline and Skytrax 2017 ‘Best low-cost long-haul airline’, an award it has won three years consecutively. The Scandinavian carrier currently operates the world’s longest nonstop route by a low-cost carrier between Singapore Changi Airport and London Gatwick, flying four times a week using Boeing 787 Dreamliner aircraft. This week, Norwegian Global Head of Sales, Lars Sande and Head of Sales UK & Ireland, Dominic Tucker delivered presentations to Singapore’s travel community to explain the airline’s low-cost long-haul model and its plans for future expansion. More than 65 agents from travel and trade organisations attended the event and received information about how it can work with Norwegian and sell the airline’s high-quality products on board brand new aircraft. Lars Sande, Global Head of Sales at Norwegian said: “It’s a pleasure to open the door to Singapore’s travel industry which will help make our new low-cost long-haul service a success. With more than 200 aircraft on order, Asia will be a key part of our future growth and Singapore offers a springboard to more competition and affordable fares in the market. Norwegian is the only low-cost airline operating direct flights from Singapore to London after launching the route on 28 September. The route is exclusively serviced by the brand new state-of-the-art Boeing 787 Dreamliner which has an economy and Premium cabin offering passengers more than a metre of legroom, generous baggage allowance and lounge access at Gatwick Airport. The route between Singapore and London also offers passengers onward connections to more than 20 destinations in Europe and the USA.